The modern organization is dashing to the cloud with the help of Microsoft Office 365. Included in this suite is hosted Exchange email and licensing for Word, Excel, PowerPoint, and much more. While Microsoft’s strategy to shift customers to the cloud is helpful, it creates a little bit of a problem for IT organizations. The issue rests in the fact that Microsoft Active Directory remains on-premises, while O365 pushes into the cloud. Keep the on-premises Active Directory server even though the rest of their infrastructure is shifting to the cloud? Can they keep AD when they wish to move to a non-Microsoft infrastructure? Is there an alternative that can integrate all these parts without installing and managing a directory? Making the move to Office 365? If you are migrating then it’s the perfect time to ask yourself the above questions and consider moving your directory services infrastructure. In order to maximize the potential it may be time to look toward an independent cloud directory service that can centralize user management while increasing security through access to virtually all of your IT infrastructure. JumpCloud’s Directory-as-a-ServiceⓇ is the next generation answer to Identity-as-a-Service. Thanks to tight integration with Microsoft Office 365, JumpCloud’s cloud directory eliminates the need for AD. 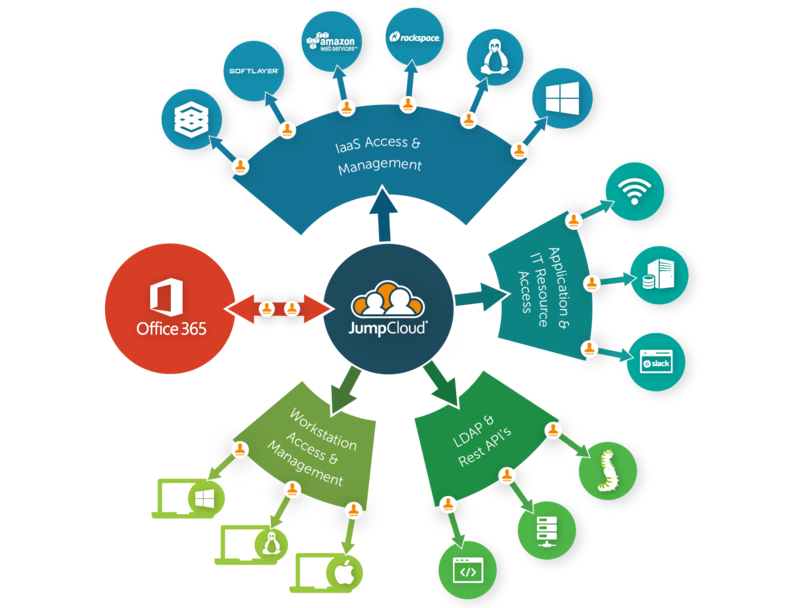 Organizations can now centralize their identity management with JumpCloud and then in turn provision, deprovision, and manage user accounts on Office 365. If you are making the move to O365 before JumpCloud, all the user accounts can be quickly imported and ultimately managed by JumpCloud. Together, Office 365 and JumpCloud change the game for IT admins, freeing organizations to make the total transition to the cloud and maximize their potential. As we stated above, the integration of our cloud directory and Office 365 allows the provisioning, deprovisioning, and synchronization of O365 identities directly from the JumpCloud management console. In addition, the importation of pre-existing O365 identities is seamless. More features includes the ability for IT organizations to extend O365 identities into systems, cloud infrastructure, WiFi authentication, other apps, and much more. Finally, the integration allows for a unity to be created across Office 365, Google Apps, System login, WiFi authentication, application signon, and server access. 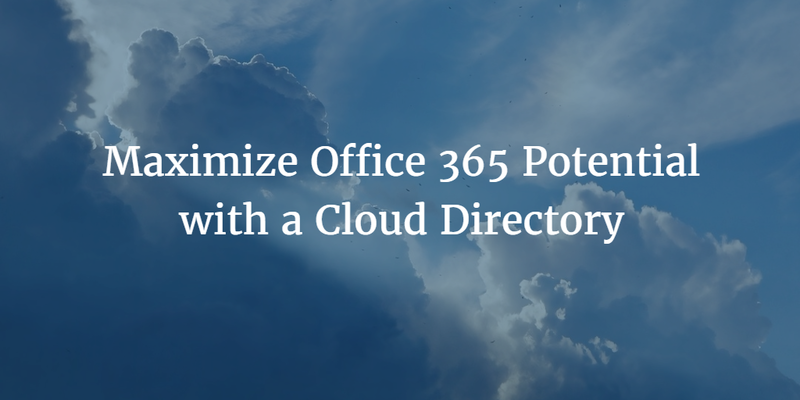 As for the benefits of joining Office 365 with our unified cloud directory, the integration brings about a complete independence of infrastructure choices. This ultimately helps an IT organization maximize potential, while giving them a single point of control for Office 365 identity management. The freedom of choice to leverage infrastructure of your own determination flows concurrent with Microsoft solutions. When you completely shift to the cloud with JumpCloud’s directory services and Office 365’s email & productivity, you leave the onerous management of the on-premises AD server in the dust. If you would like to learn more about how merging Office 365 and JumpCloud can help maximize your potential drop us a note. In the meantime, feel free to sign up for a free account – it’s free forever for 10 users.